Scientists at the University of Central Florida (UCF) have developed a new dopamine biosensor that could speed up diagnosis of conditions such as Parkinson’s and depression. The compact rectangular device uses microfluidics to first separate plasma from a few drops of a patient’s blood. This plasma is then passed over a sensor coated in cerium oxide nanoparticles that selectively capture microscopic levels of dopamine, changing how light is reflected from the sensor. By measuring the variation in light, dopamine levels in the blood can be determined. The work is published in the journal Nano Letters. 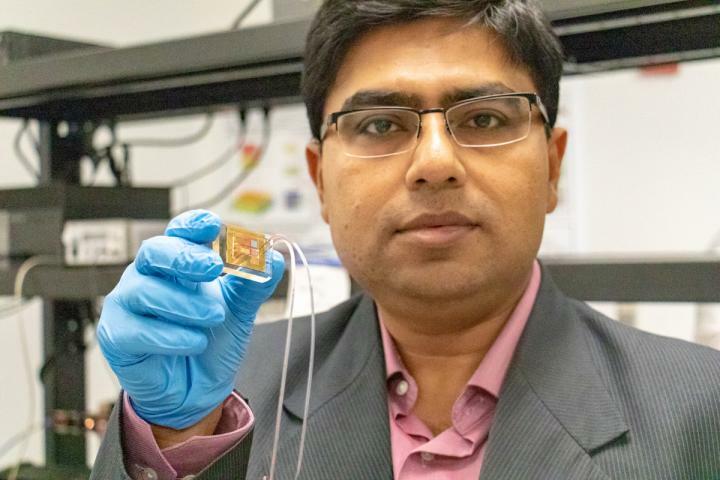 “Getting the sensor to be sensitive to dopamine had been quite the challenge for researchers for a while, but using altered cerium oxide nanostructures on the sensing platform was key in making the sensor work,” said Sudipta Seal, an engineering professor and chair of UCF’s Department of Materials Science and Engineering. Importantly, the blood sample needs no pre-treatment for the biosensor, unlike other current methods for dopamine testing. Existing techniques not only require rigorous sample preparation, but also specialised laboratory equipment, all of which can lead to delays in diagnosis and treatment. According to the UCF team, its new sensor could reduce the wait for results from hours to minutes or even seconds. More rapid dopamine testing could not only assist with diagnosis of diseases such as Parkinson’s, it could also be used to detect and treat conditions such as depression and some forms of cancer. How can I get such a transmitter?